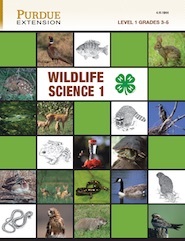 The 4-H Wildlife science curriculum is for youth who enjoy learning about wildlife. Level 1 introduces the wildlife groups: mammals, birds, fish, and herptiles. You will learn about the similarities and differences among these groups and then study each one. The full-color curriculum is full of information and activities.